I was one of the 600 million people across the world who watched Neil Armstrong take that first historic step onto the moon. I remember we wondered exactly what he would say - and for how long he had practised the words which would go down in history. I have always been glad that I was alive to experience that moment and old enough to remember it as one of the defining events of my lifetime. 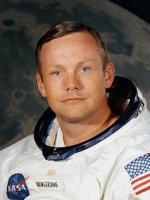 I love the fact that Neil Armstrong didn't cash in on his fame, as absolutely everyone in his position would have done today. He described himself as "a nerdy engineer" - a classic case of under-statement, if ever I heard one. He proved to the world that the moon was not made of blue cheese and was not home to the Clangers. But so much more than that. He showed us our beautiful world as seen from space. And challenged us to protect and preserve our unique, amazing, remarkable planet. RIP First Man on the Moon.